Find an idea you like, and start your build today. Step 3: Publish your new landing page and see conversions roll in! Provide a service across many cities or states? See how agency Titan PPC scores more leads for client EZBind with a geo-targeting strategy. Your first Unbounce landing page can convert leads at the top of the funnel. 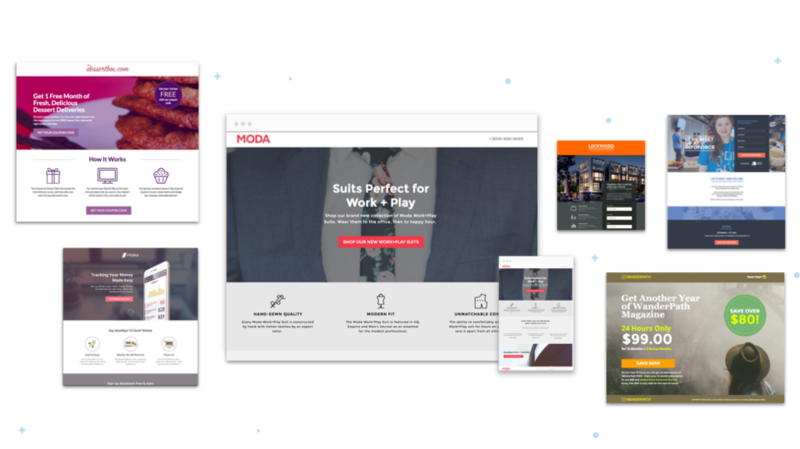 See how Tymestyle and Indochino use effective explainer pages. Got an upcoming conference to attend or sponsor? This clever landing page could save you time and money! If you run a service, start generating new business and ensure you're top of mind by offering a free consult like Emerson Media. Want to move warm leads through your funnel faster? See how brands like GLOSSYBOX turn leads into customers with a monthly incentive. Build a landing page designed for a quick revenue boost. See how Crikey uses a seasonal, 48-hour flash sale to renew subscriptions.